Trish is twenty-eight. She's unemployed, overweight, single and snarky. She knows all that. And if one more person - just one more person - tries to fix her, she might explode. Sahil is thirty-five. He has superpowers. Well, kind of. He seems to think so, anyway. He's also hot (in a geeky kind of way, but still). And he plays the guitar, helps the underprivileged and talks about his feelings. Aren't guys like that supposed to exist only in fantasies? When Trish and Sahil meet, magic happens. Real magic, you know, like fireworks, electricity, that sort of thing. But here's the problem. Trish doesn't want anyone in her life. She has enough to deal with - dependent parents, flaky neighbours, bitchy editors, the works. And yet, Sahil is determined to be in her life. Yashodhara Lal is a marketing professional and the mother of three children, apart from being a bestselling author. She graduated from IIM Bangalore in 2002 and manages to balance her professional life with her various interests, including fi tness, writing and music. She lives in Gurgaon with her rather tolerant husband Vijay and their kids nicknamed Peanut, Pickle and Papad, all of whom never fail to provide her with material for her entertaining blog at yashodharalal.com. Her fi rst book, Just Married, Please Excuse is a hilarious account of marriage. Her second novel, Sorting Out Sid is the story of a man having an early midlife crisis and, consequently, a divorce. 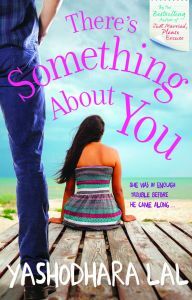 Th ere's Something About You is Yashodhara's third book.